Newt Gingrich, who is surging in the polls as the Iowa Republican caucuses draw nearer, is proposing a massive tax cut that has gotten much too little attention. That is probably a good thing for the presidential wannabe because it is exactly what most Americans don’t want and Washington can’t afford as it grapples with the aftershocks of the Bush Recession. The tax cuts are aimed at the highest earning households. Most of the lowest income families would get no benefit, while 1 percenters, who make an average of more than $8 million, would get about a quarter of the windfall. According to one analysis, the cuts would add a staggering $1 trillion to the federal deficit in a single year while permanently extending the Bush/Obama tax cuts. Nearly all deductions and credits would be eliminated except for the earned income, child, and foreign tax credits, and the deductions for mortgage interest and charitable gifts. All taxpayers would get a $12,000 per-person exemption. Corporations would see a reduction of the tax rate from a maximum of 35 percent to 12.5 percent and allow most capital investment to be written off in the year it is purchased. In 2015, when all of the changes will have kicked in, 70 percent of all households would get a tax cut compared to what they’d pay if today’s rules were extended. Everyone in the top 1 percent would be better off than under 2011 rates and would get an average tax cut of $1.9 million. 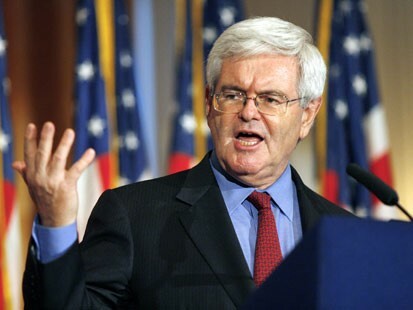 While the plan will win plaudits from anti-tax Republican primary voters, it may be a tough sell if Gingrich wins the nomination since blowing an additional $1 trillion hole in the deficit to coddle the richest of the rich don’t seem like sane policy.